I’ve been taking some time to create with my hands lately. I’ve always loved needlework – it speaks to my precision and obsessive nature – and you get to see progress. On those days where you feel like nothing is getting done (grad school or grant days, anyone? ), those quilting and cross stitch projects where you can see what you accomplish can really help. I started making my own things because how many kittens and flowers can you really make? When I started bringing them into work, some of the students got interested and they joined me – and we are now CRAFT GEEKS! We have our own Etsy shop and website (still in progress) and all proceeds will go to science outreach. We have our first craft fair coming up at the beginning of December so this post is basically to explain why I’ll be MIA getting ready for it. 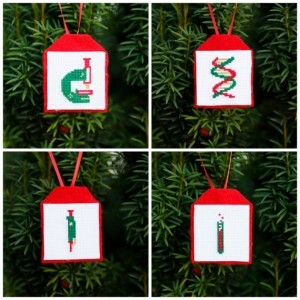 Christmas ornaments for molecular biologists and others who love looking at small things. I’ll try to do some posts that feature some of our extra fun things (like virus ornaments) soon!